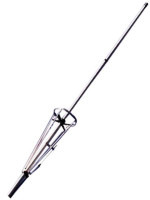 The Exterminator is our most powerful FM Broadcast Antenna to date. Designed from the ground up the Exterminator® slams the competition. Produced to exacting standards using state of the art electrical and mechanical designs resulting in superior performance and long service life. The high grade construction and DC short protection will provide peace of mind to stations who want to Stay On Air and withstands the toughest environments. Arrives fully tuned and easily assembled the Exterminator can be installed on your tower or mast in a matter of minutes. Tuning to a new frequency takes only minutes thanks to our wideband gamma matching system. When measured against a standard 1/2 λ dipole the Exterminator® delivers a massive 6.3 dB gain across the entire BAND III TV VHF Band. All RF connectors are teflon components with specifications that exceed required ratings. Once tuned to your frequency the Exterminator® will never go "out of tune". Remember to include your desired frequency during check out, write it under comments. You can always tune your antenna alone with SWR meter and included instructions. - Weight (approx. ): 9 - 10 lbs. - Mounting mast: 1 to 3"